A quality kids bike offers lightweight adjustability designed to make riding fun. For the very young ones, the choice is generally between a run-bike and a tricycle. Tricycles introduce toddlers to the concept of pedaling to get around. Run-bikes are two-wheeled, and introduce toddlers to the balance and coordination of a larger bike. 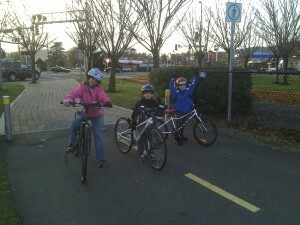 Children who graduate from run-bikes often don’t need training wheels. 12″ bikes are perfect for three-year-olds graduating from run-bikes or tricycles. They’ll feature pedal-back brakes and a single speed. 16″ bikes bikes generally fit four to six-year-olds. They’ll also feature pedal-back brakes and a single speed. 18″ bikes will fit most five to seven year olds, and usually come equipped with a hand brake and a single speed. 20″ bikes generally fit seven to nine-year-olds, though some tall six year olds will also fit. In a 20″ bike, there is a wider variety of options: there are the cruisers, which feature a single speed and pedal-back brakes, there are kids’ mountain bikes which feature gears and hand brakes, and there are BMX bikes which are single speed with hand brakes. If any family riding is planned, kids’ mountain bikes are often the way to go as the gearing makes it much easier to keep up with adults. 24″ bicycles fit most 9- to 12-year-olds, though many at that age can also fit an extra-small adult bicycle. For those kids not ready to ride on their own, we have a variety of other options to let you still get out on family rides. Those options range from baby seats and trailers to Trail-A-Bikes that let kids pedal.